NIRAS-ONDRAF takes care of the day-to-day management of all the radioactive waste produced in Belgium. It develops and implements sustainable solutions protecting human health and the environment. For reprocessing and conditioning of all types of radioactive waste and the interim storage of conditioned radioactive waste, NIRAS-ONDRAF calls on the services of its subsidiary Belgoprocess in Dessel. Radioactive waste is divided into three categories based on its level of radioactivity (low, medium and high) and its half-life. The spent fuel assemblies contain waste belonging to categories B and C.
NIRAS-ONDRAF and Belgoprocess already have recognised expertise in the interim storage of waste from reprocessing. The waste from reprocessing the spent fuel assemblies, i.e. 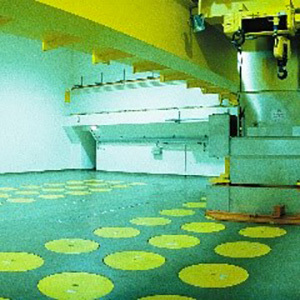 medium- and high-level radioactive waste with a long half-life, is brought together in bunkerised buildings on the Belgoprocess site. These buildings house a few hundred containers of vitrified waste and of compressed waste. A few dozen containers of waste are expected to be returned to Belgoprocess in 2017. Is there any time limit on final storage? NIRAS-ONDRAF needs to have a definitive solution for all the waste falling under its responsibility. 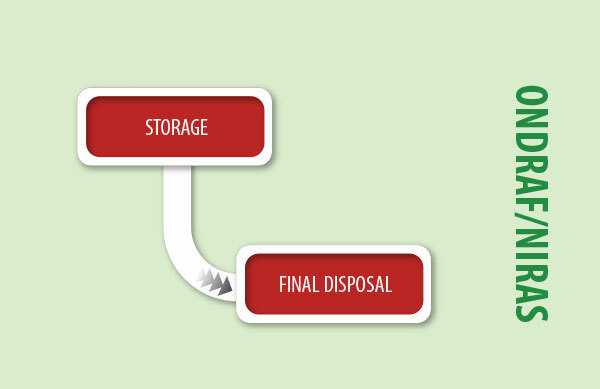 The final storage of category B and category C waste in stable deep geological repositories is internationally recognised as a very safe long-term solution for managing this type of waste. In 1995, NIRAS-ONDRAF and the Belgian Nuclear Research Centre (SCK•CEN) established an Economic Interest Grouping (EIG) called EURIDICE. EURIDICE operates an underground research laboratory in Mol/Dessel, called HADES (standing for "High Activity Disposal Experimental Site"). Large-scale research is conducted there over a long period into constructing, operating and closing a waste repository in a deep layer of clay. A new experiment, PRACLAY, was launched in 2015 to analyse the clay's behaviour in response to heat. Nowadays, NIRAS-ONDRAF recommends deep geological repositories in poorly indurated clay. In particular, NIRAS-ONDRAF takes as its basis the experiments that have been carried out in the HADES laboratory since the 1980s. The PRACLAY experiment currently in progress also aims to provide confirmation that the properties of Boom clay that are favourable to storing radioactive waste are retained even after some 10 years of heating. When the experiment ends in 2024, and provided this yields conclusive results, NIRAS-ONDRAF can then start searching for a suitable site for final storage.